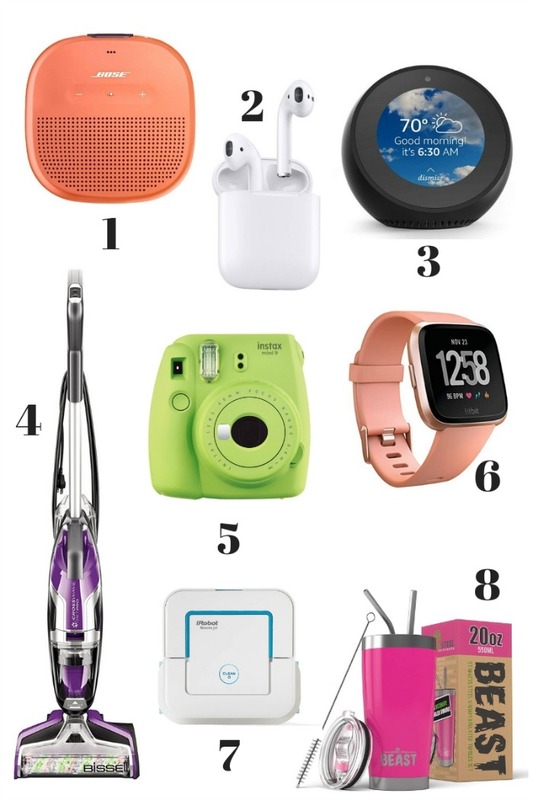 2018 Holiday Gift Guide for Her – Take a peek at some of the hottest gifts of the season! Perfect for girlfriends, mothers, sisters and of course, even you! Who’s ready for Black Friday shopping? Can I be honest for a minute? I used to go, but then I had kids. When they both were out of diapers, I cherished my new-found sleep. I’d rather sleep than shop, wouldn’t you? Today, the whole concept of Black Friday is kind of skewed. I’ve been seeing sales since this past weekend referencing Black Friday, and now retail stores don’t even wait until Friday to start – they open Thanksgiving night. Want to know what I think about that? I’m not a fan. There’s a chance I may never step foot in a retail store again over Thanksgiving. Why? Well, I still cherish my sleep, I can’t stand dealing with that many people (let’s be honest – I’m really talking about hoards of women here) and if I really want something, I just buy it online, whether it’s the lowest price of the season, or not. I get it. Some of you are ALL about the deals. I completely respect that. For those of you braving the stores, may the force be with you and may you come home with all that’s on your list. 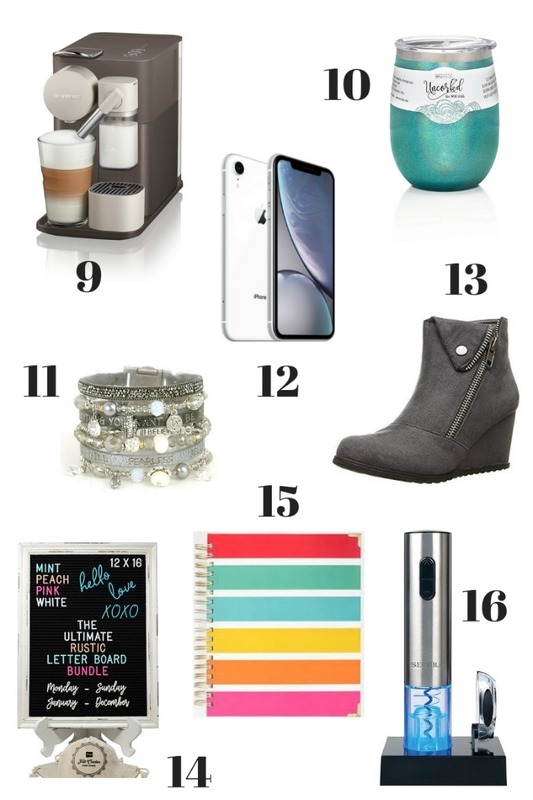 I’m sharing my first holiday gift guide. Are you ready to do some shopping? All you need are your slippers, a cup of coffee and a credit card. ? 01 | Bose Soundlink Micro Bluetooth Speaker $99 – If you’re looking for a rugged Bluetooth speaker that can stand up to the elements, offer six hours of play time and be used as a built-in speakerphone, this is it. Those who have purchased this speaker rave about the clarity and the sound. In the end, it’s all about the BASS, isn’t it? 02 | Apple AirPods $159 – My husband has AirPods, and for months I’ve teased him and called him a geek when he’s had them in his ears. Now, I want a pair. I want to be able to take calls and listen to podcasts while on-the-go, so these are on my list this year. I love that you can get up to five hours of listening time on one charge and it’s pretty neat that these charge right in the case they come in. If Amazon is not offering these for purchase, you can buy them directly from Apple’s website. 03 | Amazon Echo Spot $130 – Amazon Echo Spot connects to Alexa and is designed to fit anywhere in your home. You can watch videos, see music lyrics, summon weather forecasts, view shopping lists, browse and listen to Audible audiobooks – all hands free. 04 | BISSELL Crosswave Pet Pro $300 – Who wants a vacuum for Christmas you ask? This isn’t just any vacuum, my friends. This beautiful machine vacuums AND WASHES your floors at the same time. It’s made for homes with pets and is safe for even sealed hard floors and area rugs. Some of my greatest gifts have been vacuums (yes, I’m serious), and this one stole my heart immediately. It really was love at first sight. 05 | Fujifilm Instax Mini 9 Instant Camera $56 – Oh my gosh. Let’s take a trip back in time for a minute. This camera comes in SO many fun colors and it’s perfect for gatherings with friends and family. It’s the newest “polaroid” on the market and develops your pictures instantly after you take them. So much fun. 06 | Fitbit Versa Smart Watch $198 – The FitBit Versa has a 4+ day battery life, tracks your all-day activity, heart rate, and sleep stages – it’s water resistant, can record your workouts and stores 300+ songs. Need I say more? 07 | iRobot Braava Jet Mop $169 – Another cleaning product? Yes, I’m sorry. Okay, #notsorry. This is for anyone who dreads cleaning their floors. This little beauty mops and sweeps hard floors, including hardwood, tile, and stone in kitchens, bathrooms, and other small spaces. The result? Clean, shiny floors without the aching knees to go along with them. Enjoy your favorite Netflix series from the couch while the iRobot Braava does all the work! 08 | Greens Steel Beast Insulated Stainless Steel Tumbler Set $22 – I get that this tumbler isn’t a Yeti, but from the online reviews, it’s Yeti quality without the Yeti price. That’s something we can all get behind. Oh, and there are 12 – COUNT THEM 12 – different colors to choose from! 09 | Nespresso Lattissima ONE $250 – Now you can brew espresso, cappuccino and latte in one touch, in under one minute. . . at your house. Prayers answered, dollars saved. 10 | BruMate Uncork’d Insulated Stainless Steel Wine Glass $20 – This stainless steel wine glass can hold over 1/2 bottle of wine and keep it cold for up to 6 hours. Did I mention they’re available in 10+ colors? 11 | Goodworks Come Together Cuff Bracelet $62 – I LOVE Goodworks bracelets. More than anything, I love the scripture and messages on them – positive and inspirational. I ran into my first Goodworks bracelet at a Buckle store a few years ago. Now they have them on Amazon and you can also order them directly from the retailer. 12 | Apple iPhone XR $975 – Whew. I know. The price tag stings. But this phone is AMAZING. It comes with liquid retina display, face ID and a powerful camera that will make you wonder why you’re still hanging onto that DSLR. 13 | 2 Lips Too – Too Nine Ankle Bootie $40 – I have these booties and I adore them. I get compliments on them all of the time and they’re super comfy. I survived two days of standing in a trade show booth wearing these booties. They’re the best and I love how cute they are! If Amazon is not offering these for purchase, you can purchase them from the retailer I got mine from. 14 | Farmhouse Vintage Black Felt Letter Board $42 – These felt boards are so much fun, and perfect if you’re looking for a decorative element in your home you can continue to change up. Display menus, inspirational messages, scripture verses and more! 15 | Living Well Planner $50 – If you are serious about staying organized in 2019, you need this planner! It’s the only one I use! With your planner purchase you get access to Crushing it Central, an online portal containing videos and tutorials on getting started with your planner and tips on managing your budget, meal planning and cleaning too! 16 | Electric Wine Bottle Opener $20 – This wine bottle opener was on my list last year and I got it! It really takes the guess work and hassle out of uncorking bottles of wine and looks really cool in your kitchen and/or bar area, too! 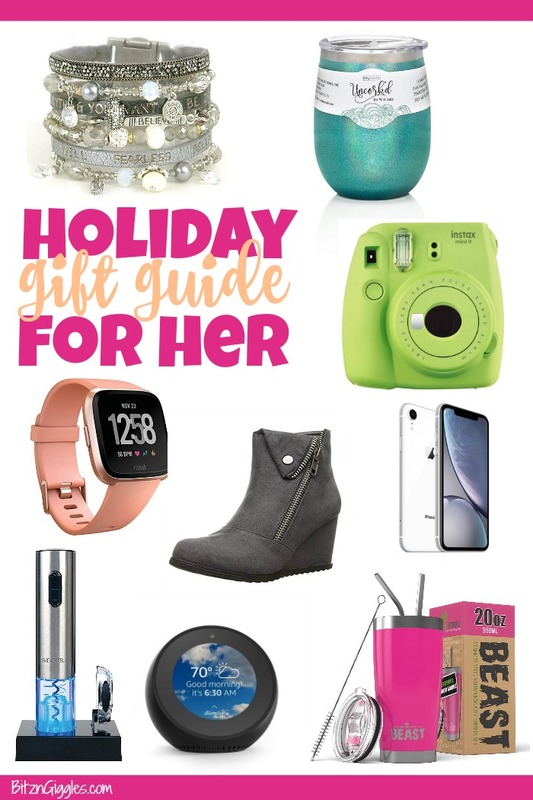 I hope this list provided some inspiration, either for gift giving or for creating your own Christmas wish list. Which gift is your favorite? I’d love to hear in the comments. Have a wonderful rest of the week and may you have a blessed Thanksgiving with your family and friends. And when it comes to shopping. . .best of luck to those of you who will be braving the crowds on Black Friday, and high fives to those of you who will be shopping online in your pajamas from the comfort of your home. ? Now GO & GET THAT SHOPPING DONE!! That Nespresso looks amazing. That would be a perfect Christmas gift for me. I’ve heard so many great things about the Nespresso. I think it’s on a lot of peoples’ Christmas lists this year! I hope Santa brings you one! ?